Keratosis Pilaris is a common skin condition made up of small bumps found on the upper arms, thighs, buttocks and sometimes on the face and mistaken for acne. 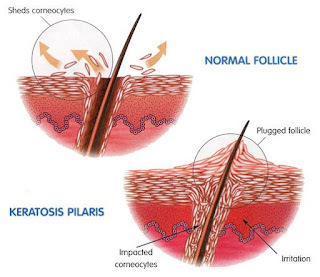 It occurs when keratin forms hard plugs within hair follicles. It often appears red in color and feels very rough and doesn’t require any serious treatment. Tests aren’t needed to diagnose the condition, as your doctor can usually tell by looking at your skin. Also known as Chicken Skin, Keratosis Pilaris affects 50% of the world’s population. People with conditions like Atopic Dermatitis are more likely to have Keratosis Pilaris as well as people with very dry skin. It is harmless and can be treated by using skin creams and moisturizing lotions. Improvements can take a long time and bumps are likely to come back. As an adult, the condition slowly starts to fade. If the condition still irritates your skin, your doctor can prescribe a lotion that would be best for you. You should avoid picking at the bumps as it only worsens your skin and even leads to scarring. Scrubbing is also not recommended as it leads to more irritated and red skin. Future content on this website will show you more information about Keratosis Pilaris and how you can help treat the condition. Keratosis Pilaris is normally a non-detrimental disease but in case of red bumps and swelling on the skin, one must consult the doctor immediately. The major victims of the disease are teens and children. However, the bumps disappear as time passes. Keratosis Pilaris is widely common in people with dry skin as dry skin has a higher tendency to get affected by the disease. Keratosis Pilaris is caused due to enrichment of keratin in your skin which develops a blockade of hair follicles and thus the bumps appear. Medical sciences do not know exactly the reason behind the build-up of keratin. Avoid scratching your skin as it will make bumps look terrible and painful. Make use of moisturizers which is helpful as it will help you to reduce the bumps and make your skin smother. Avoid contact with hot water when in the bath or shower. Make use of soap or a skin cleanser that enriches in oil. Use special moisturisers, which is good especially in winter, because winter is the most difficult season for KP patients. In the end it can be easily said that Keratosis Pilaris is not a harmful disease and it can be better if sufficient care is taken. Actinic Keratosis, also known as Solar Keratosis is a skin condition developed on sun-exposed skin. It is most common on the face, neck, forearms and hands. It appears similar to scabs which are often dry, crusty and rough. Actinic keratoses might develop into specific types of skin cancers, which can be diagnosed with a skin biopsy, but regular Actinic Keratosis can be diagnosed by a health-care professional by simply observing your skin. Those with fair and light skin, green or blue eyes and blonde or red hair have a higher risk of developing Actinic Keratosis. People with specific rare skin conditions, like Xeroderma Pigmentosum are likely to have AK. Adults are more likely to have it, due to the longer periods of sun exposure. Africans are far less-likely to have actinic keratoses. Reducing the amount of sun exposure is considered to be the best treatment for actinic keratoses. There are many other treatment options available. These are some of the most common ones. Cryotherapy – Cryosurgey solution is sprayed on the lesions, freezing the cells. They become scabs and eventually peel off. Chemical peels – A chemical solution is applied to the lesions, causing them to peel off over time. An example is 5-FU. Excision – This will cut the lesions from the skin. This will most-likely be used if the lesion is cancerous. Curettage and cautery – The lesion is scraped off and and heat is applied to the surface of the skin. Light therapy – Also known as phototherapy. A chemical solution is applied to the lesion, then your skin is placed under a specific light exposure to kill the cells. If you are afraid your AK is serious, see your doctor for inspection and possible treatment. Remember to lessen the sun exposure of your skin to prevent the AK from developing further. 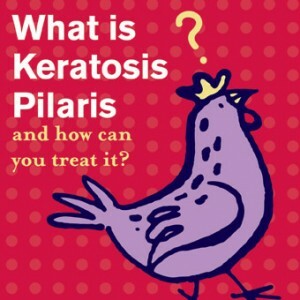 The cause of Keratosis Pilaris is not entirely understood. It is believed to occur when keratin, a human skin protein is over-produced and plugs hair follicles, causing the rough bumps to form. 50% to 80% of young people are said to have Keratosis Pilaris, and 40% of all adults have it. KP is not contagious and is more common in the winter months and less common in the summer months when the humidity is higher. More women appear to have the condition than men, and it can become worse for them during pregnancy and after childbirth. As you age, Keratosis Pilaris usually disappears or lessens greatly. Your KP will become worse when your skin is dry, so cleansing and exfoliating your skin is important. Food is also believed to make your condition worse, causing the bumps to grow bigger. Keratosis Pilaris Rubra – red patches on the face. Keratosis Pilaris Alba – white or skin-coloured bumps. 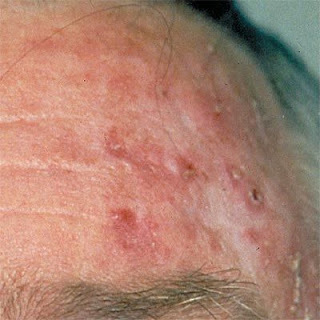 Keratosis Pilaris Astrophicans Faciei – Another facial condition, similar to rubra. There are many more KP-like conditions to discover. Most of them are harmless and you shouldn’t worry if you have one of these. Because KP is very common, it isn’t considered unnatural to have it, and the exact cause is nothing serious. If you want to understand more about the causes of Keratosis Pilaris, see your healthcare professional. You will know more about the causes of your specific condition. There is so much more to know about KP and we will bring you more information in the future. We will write about the different types listed above and the specific treatment options for each of them. Right now you’re reading this post because you are interested in treating keratosis pilaris. 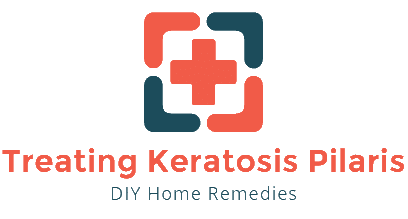 I have been treating keratosis pilaris for over three months now and would like to share with you my observations of which keratosis pilaris treatment methods work and which ones have not worked for me. There are a variety of treatments for keratosis pilaris including the use of topical lotions, exfoliating scrubs, microabrasion beads, sunbathing and Seabuckthorn. Treating keratosis pilaris can be an expensive process and can cost you hundreds of dollars in topical lotions and scrubs. I for one have gone the thrifty route and do not like spending a lot of money in keratosis pilaris treatments. 1. Exfoliate - Make sure you exfoliate every other day with an abrasive loofah or scrub. I prefer to use the KP Heavy Duty body scrub from Derma Doctor, but you can go the cheaper route and use Cetaphil and a loofah. The key point is to get exfoliate and get rid of the keratin build-up. 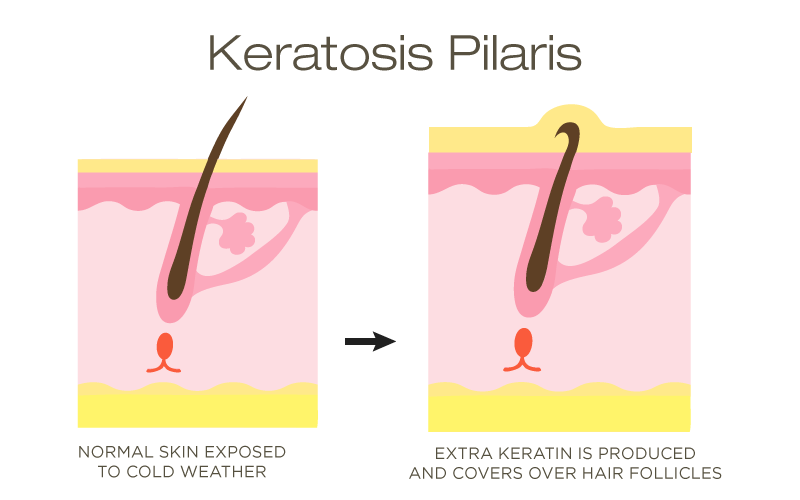 The rough, bumpy skin that is caused by Keratosis Pilaris is due to an excessive amount of keratin that clogs the hair follicle. Exfoliating helps reduce and unclog the keratin buildup in your pores. Some people have very delicate skin that can not handle the abrasive nature of loofahs. If so, make sure to lightly exfoliate with a less abrasive scrub or loofah, but most imporantly, you MUST exfoliate. Without exfoliating, your skin will always stay bumpy. 2. Use a topical lotion - After exfoliating and drying off, apply a topical lotion. For keratosis pilaris treatment, I would recommend a topical lotion thats main ingredient includes either lactic acid, retin-a or urea. Again, I use Derma Doctor KP Duty Repair Lotion, however it’s quite expensive (about $80 for the set). If you want to go a cheaper route, you can use AmLactin. AmLactin can be found in your local drug store. I bought my bottle of AmLactin at Wal-Greens for around $11. The only problem I had with AmLactin is that it stings when you apply it to skin that has cuts or scratches (it contains lactic acid). The benefits of using AmLactin is that it made the skin on my arms MUCH smoother. If you want to go even cheaper than AmLactin, you can use Eucerin Intensive Repair Lotion. Eucerin also helped my skin become smooth. Remember, to treat keratosis pilaris, you must exfoliate and then use a topical lotion that contains active ingredients (lactic acid, retin-a, urea). Keratosis Pilaris treatment is a tedious task, but you will be awarded for your diligence by having beautiful skin. With warmer weather coming around the corner, wouldn’t it be nice to show off those keratosis pilaris free legs and arms? Reminder, do NOT use scented soaps or lotions. Scented soaps and lotions can aggravate your Keratosis Pilaris and cause additional KP buildup. I also recommend cleansing with Cetaphil because the soap is hypo-allergenic and non-scented. 3. Sun-bathing - Summer is almost here and with summer comes sunshine! Sun tanning is another way to reduce the red spots caused by keratosis pilaris. However, I do not condone or recommend sun tanning as a way to treat keratosis pilaris. I just want to state that in my case, sun tanning has helped reduce the red spots on my skin. Actually, it’s helped a lot. I will post pictures soon. 4. Drink lots of water - This one is a no brainer, but in order to hyrdate your skin, you must drink lots of water. Carry a water bottle with you at all times and make sure you drink at least 8 cups of water a day. Dry skin can increase the keratosis pilaris on your skin. Using chemicals to treat Keratosis Pilaris can be very expensive and there is no guarantee your red, bumpy patches of skin will disappear. Treating Keratosis Pilaris naturally is the best way to help clear your skin from the condition. Both unnatural and natural methods of treating the condition don’t actually remove it, but they do reduce the bumps and help lessen the skin’s dryness. After some time, usually over the age of 30, your Keratosis Pilaris manifestations start to vanish. Clean: Cleaning the skin is a very important step. There are many ways of doing this, but one of the most recommended ways is to use apple cider vinegar twice a day to help heal the skin. This could even be found in your home and isn’t expensive at all. Exfoliate: Exfoliating is an important step in getting rid of those bumps, and it should be done often. Be careful not to over-exfoliate as it can harm the surface of your skin. An exfoliation scrub can be made at home which will remove the dead skin cells and clear up your skin. Using these three methods often will heal your damaged skin and save you money from the unnatural methods of treating Keratosis Pilaris. I will provide more on how to treat this condition in future articles. Keratosis pilaris, also known as KP or chicken skin, is a common genetic follicular condition that affects many people, being manifested with the appearance of rough and red bumps on the skin, being one of the most common skin diseases that affects the young population. It usually appears on the back and the arm, but it can also appear on the thighs, hands, legs, buttock, and almost any other body part excepting the palms or soles of the feet. There are even times when it can appear on the face, being easily mistaken with acne. Even if it appears almost all the time, it is more predominant in the colder months, when the moisture levels from the air are lower. It usually affects the people who have dry skin. In order to treat chicken skin in an effective way without harming your skin, you should seriously think about using some common home remedies that are actually very beneficial. For instance, those who want to try a natural remedy, the coconut oil is the perfect answer. After a few days of use you will be able to see the results. Even if keratosis pilaris is harmless and there is no necessity to start any treatment, there are many people who want to get treated because of cosmetic reasons. If you suffer from KP you already know that it is unaesthetic, and therefore you will wish to get an effective treatment as soon as possible. It has been proven that this is a problem that affects the self-esteem, lowering it considerably, and therefore it can easily lessen your lifestyle quality. You may also want to clean your area with a Dyson DC24 vacuum cleaner. Or not. Who Is Affected By KP? If you are affected by keratosis pilaris you don’t have to be worried because KP actually affects approximately 40-50% of the adult population, and approximately 50-80% of the teenagers. It affects more women than men, and it is not related to any diseases, often affecting healthy people, and the condition can be found in the case of many races, no matter the age (even if it is more likely to appear in the first decade of life). The symptoms may become worse during pregnancy or after birth. Since there are many creams and lotions that are not able to cure the chicken skin, and mainly because these treatment forms can be very expensive, it is time to think about more natural ways that are able to improve your condition. If you really want to improve the KP, you will have to start a proper skin care method and a proper diet. Therefore, if you want to see results, you will need to start with the basics. You should include in your diet foods that are rich in Vitamin E, and also omega-3, 6, and 9. These acids help to stimulate a healthy process of skin exfoliation, and therefore they aid your skin remove the body toxins. Besides this, regular cleansing washes away the dead skin cells that can be found on your body. You can also try detoxification to get rid of the entire amount of toxins that can be found in your body. There are no needed any tests in order to diagnose this problem, and the doctors usually take into account the family history whenever they are making the diagnosis. However, when the treatments don’t have any results and the condition is getting worse, the doctors will make further analyses. How Does Keratosis Pilaris Occur? KP occurs when the body produces too much keratin, which is a natural protein in the skin. The excess of keratin surrounds the hair follicles in the pore, causing the formation of hard plugs. In many cases, the KP bumps actually contain an ingrown hair that has coiled, and therefore the hair grows encapsulated in the follicle. These bumps on the skin are actually caused by the increased amount of keratin that is produced by the human body. However, there is a certain difficulty to establish the exact factor that cause this keratosis. However, it has been noticed that this affection may be inherited, and there are at least 50% of people who have identified a genetic predisposition, usually affecting the members of the same family. The primary cause may be related to the hypersensitivity reactions. There has been noticed that those who wear tight clothes can also aggravate their situation, and besides this, if you are eating spicy food there is a chance that you will increase the form of these red bumps on skin.